You consider yourself a refined woman. You love the better things in life--good culture, good books, good food. You carry yourself well, know which side of the plate to set the fork, and always send a thank-you note. You dress with style, decorate with aplomb, and practice good grooming habits. So why is it that you leave that unpleasant odor behind whenever you do your business in the bathroom? As a guest in any home, you want to create a good impression. It's all been going splendidly. The hosts love the lemon meringue pie that you made just for this occasion. The espresso is served, and the conversation is oh-so-scintillating. Suddenly, you have to go. As in, right now. You excuse yourself delicately and scurry to the guest bathroom. With relief, you unburden yourself, but realize you've also unburdened yourself of a most unpleasant scent. Good thing you've got your travel size Island Mist Aquinelle Toilet Tissue Mist with you. First, you wet your wipe for a fresh, clean finish. Then you spritz the bathroom for a fresh, sweet scent. You flick on the fan as you sweep back to the party, and no one is the wiser. Your old college chum is in for the weekend, and she's exclaiming over how adorably you've decorated your one bedroom apartment, and how kind you are to sleep on the sofa and give up your one bed for her, and how she doesn't mind at all sharing the one bathroom. Good thing, you've stocked it with a full-size bottle of Coco Beach Aquinelle Toilet Tissue Mist, so that no embarrassing scents are left behind by either party and everyone is freshly wiped. Way to keep your dignity. You've booked a romantic cruise with a tall, dark, handsome man, and being the proper lady that you are, your suites are adjoining. The only problem is that the room that adjoins you is a shared bathroom. Not only do you not want to know the depth of his manly smells at this early stage in the courtship game, you also don't want to expose him to any of your odors that are less than ladylike. This is one area where you do want to get fresh--both on the rear and in the air. Just leave a bottle of Citrus Burst Aquinelle Toilet Tissue Mist strategically placed as a subtle hint to keep it civilized. No need to rush things, after all. You've landed a big job interview, but getting there requires taking a train and a subway. You arrive early, hoping to primp in the bathroom first, only to learn that the one restroom is located right smack in the middle of cramped offices. Dream job? Maybe. Dream space? Definitely not. You step gingerly into the bathroom, feeling all eyes on you. You turn on the water faucet to keep your possible future co-workers from hearing you, but how do you keep them from smelling you? Thank goodness you thought to pack your Pink Grapefruit travel size Aquinelle Toilet Tissue Mist. You can go into that interview holding your head up high, knowing you are well wiped and have left a fresh scent in your wake. A few good friends gather for lunch at the latest hot spot downtown. You've been waiting for months to get a reservation, and you can't wait to sample the fare. Between courses, you and a girlfriend excuse yourselves to freshen up. Unfortunately you need to heed the call of nature as well. While your friend waits to relieve herself, you are sitting in the stall sweating bullets, trying to figure out how to eliminate the odor, while also keeping up a steady stream of nervous girl talk. In a moment of brilliant inspiration, you grab your travel size bottle of Ocean Breeze Aquinelle Toilet Tissue Mist. A few well-timed squirts, a nice wet wipe, and you are leaving the stall as fresh as you found it. 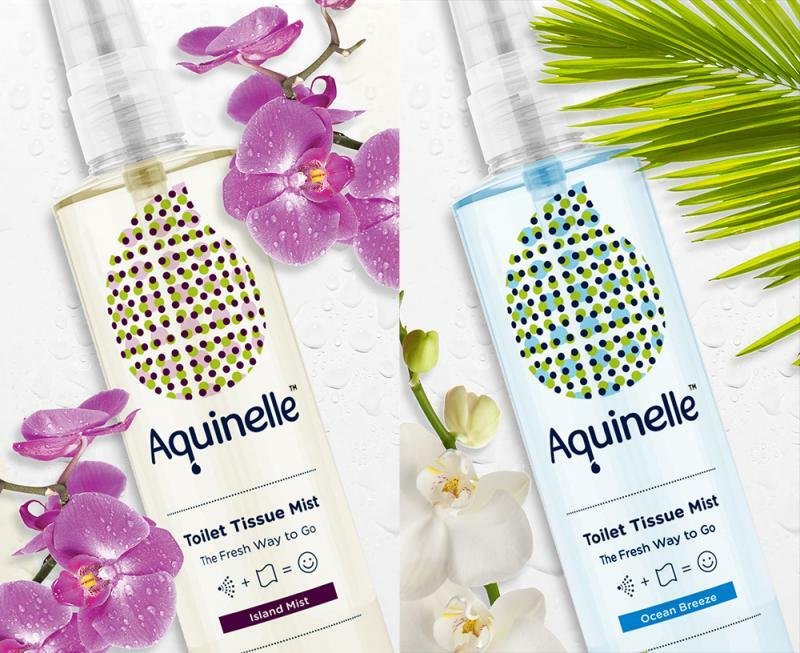 To purchase Aquinelle Toilet Tissue Mist, visit the website, and always come out smelling like a grapefruit, or a rainforest or an ocean breeze, or more.